A subtle but very sophisticated hardy evergreen shrub that is found in all the best gardens. 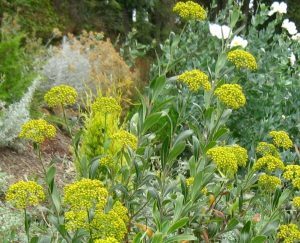 Shiny sea-green leaves are reminiscent of a Euphorbia and are handsome year round. In summer long stems sport umbels of chartreuse green flowers gives away its familial affinity to Dill. Tough shrub that is adaptable to all but boggy soils. To 6’ tall and as wide in several years. Blooms on new wood, may be hard pruned in early spring nearly to the ground to refresh. Equally tolerant of drought and regular irrigation. A great plant that instantly makes a planting look sophisticated. Excellent with Lavenders and Russian sage. An irresistible pollinator plant that will be covered in multitudes of insects while in bloom. Very easy to grow.